A Chinese cook is the brains behind these noodle-slicing robots. 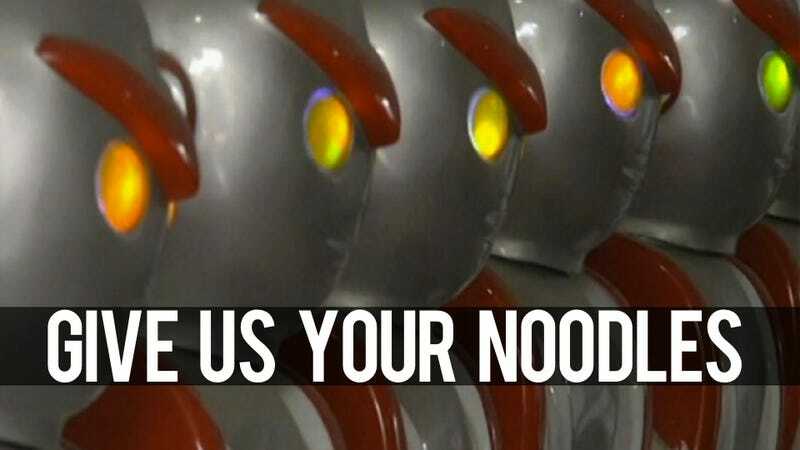 Japanese superhero Ultraman inspired the appearance, but necessity inspired the concept: last year, the cook needed help slicing the Northern Chinese dish "knife cut noodles" and created a robot friend to pitch in. Now, the cook is mass-producing the robots—robots with pissed-off eyebrows—and selling them to other restaurants. To date, the cook-turned-robot-magnet has sold over 3,000 bots with each priced at 10,000 yuan (US$1,600). According to People's Daily (via MIC), the noodle bot can cut up 150 noodle slices per minute. It's an automatic slicer, and the arm continuously dices and slices. However, the lights in the robots' eyes flash, and the contraption even plays music! Ultraman fans will be happy to know that the Ultraman inspired creations even have Color Timers (Ultraman's lawyers might not be so thrilled), but let's hope that these timers don't mean the robots can only stay on Earth for only three minutes! If you do not like the Japanese superhero version, it seems the robot can be fitted to other casings—such as a pig chef, scary sheep, or oh-Lord-no-no Pinocchio. Check out the robot in action in the People's Daily link below.